The project was started in 2012. Situated on the site of an abandoned kitchen garden the plot is an off grid garden: with water pumped by solar panel from the stream and a straw bale building with solar lighting. 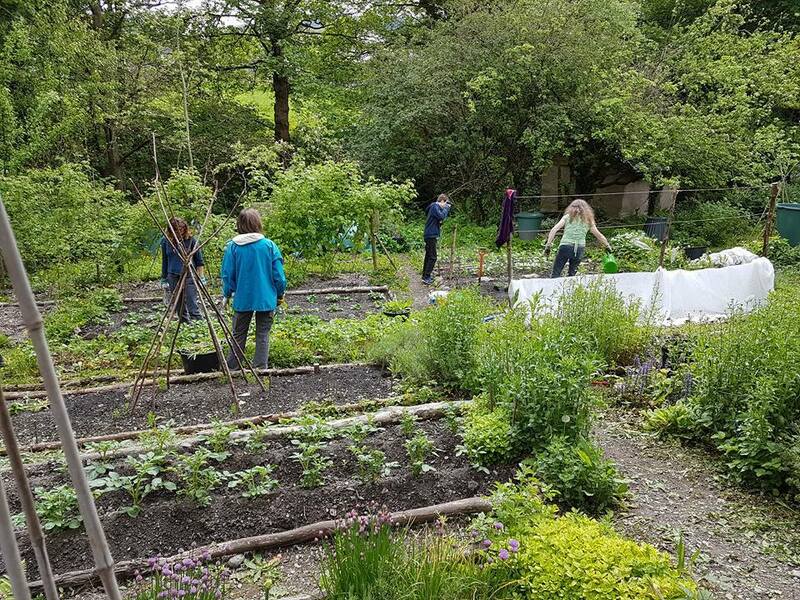 Volunteers grow vegetables, fruit and flowers to share and also manage the plot for wildlife. Gardeners of all ages are welcome and the group have also hosted visits from the local school, guiding and scouting groups. The main group garden session runs on a Saturday morning throughout the year. Garden gate is next to the bridge over the small river. Coming from town, head up towards Plas Newydd. Pass the entrance to Plas Newydd, heading towards Pengwern estate. The garden is on the left before the small bridge.